Well, my faculty colleagues at I have never had private offices — which is why I never do any serious work on campus. And earlier this semester — as I noted in a tribute to my soon-to-be-lost office window — we moved from group offices to an open-plan office. It’s been (shall we say?) a bit of an adjustment. Big news in spatial politics in Spring 2014 included the rooting-out of a ubiquitous sleeper cell that, for half a century, has infiltrated corporations and governments across the globe. That’s right: the cubicle. Nikil Saval’s Cubed: A Secret History of the Workplace, sparked widespread interest in the mundane environments in which a global force of laborers files reports, types up minutes, and wastes time on Facebook. This multi-person “pod,” a variation on the cube, is also where New School faculty will increasingly find themselves prepping for classes, editing articles or films, and meeting with students. The School of Media Studies moved this February to new quarters on the 16th floor at 79 5th Avenue—the former home of the Office of Finance and Business, which left behind a labyrinth of waist-high file cabinets, carving the main floor into a cluster of four-person pods, and rows of private offices (some with spectacular views). Ours is, we hear, the faculty workspace of the future. It’s about “activating the most spaces on campus for the most hours in the most flexible ways,” an administrative staff member told me. In my shared pod, I have more filing cabinets than I know what to do with, along with three generous rows of bookshelves. 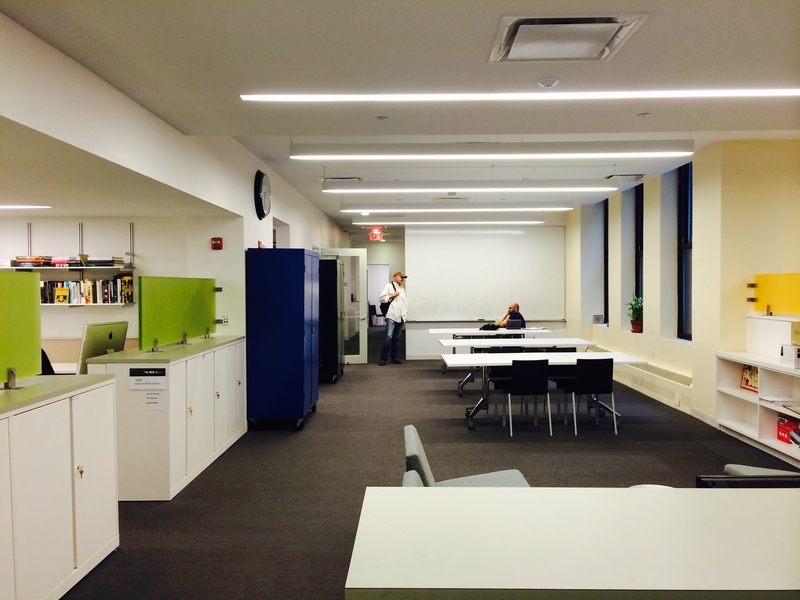 We’re adjacent to the kitchen, the copy-and-mail room, and a common lounge and group work area. Another pod is adjacent to a meeting room that’s bookable by anyone from across the university. It is indeed invigorating to see the floor “activated” by so much activity. Having been squeezed into deficient space for nearly four decades, it’s certainly heartening to finally have not only basic amenities, but also common areas where Media Studies can cultivate its identity through community. That “activation” brings energy and density. And noise. Faculty cushion their brains with noise-canceling headphones when they need to concentrate. Students waiting for appointments sometimes stuff their own ears with earbuds so as to avoid accidentally eavesdropping on private conversations. Meetings in the common work areas and conference room create a flurry of activity that makes it rather difficult to concentrate on crafting that perfect concluding sentence or a subtle audio mix. 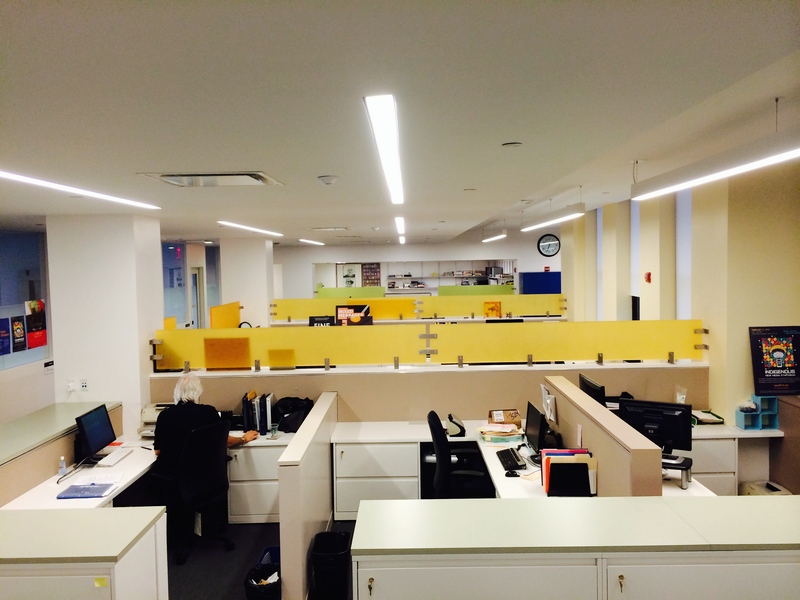 These most mundane spaces have a profound impact on how we work—especially together. They determine how we engage with others, how we focus our energy, even how we think. 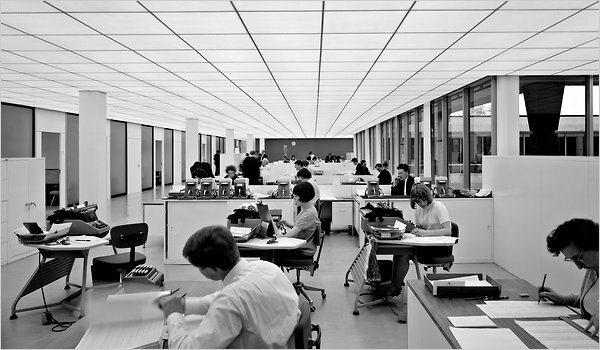 While an open office might maximize use of the space across time, it also imposes a spatial model of bureaucratic labor on those who often engage in activity that defies such regimentation. These “workspace solutions” sometimes create new problems. 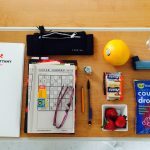 What are the various kinds of activity—writing, reading, mixing, sewing, model-making, advising, daydreaming, etc.—that are integral to our work as faculty? What kinds of spaces best facilitate those activities, in all their variety? What are the ethics and ideologies, the affects and identities, that we want those workspaces to embody?